First I created a new collection inside my "Print Copies" collection set titled "Birdie Birthday" and added the 3 processed images you see above (See Step #1 in this post for more info). With all 3 images selected inside this new collection, I clicked into the Print module and selected the "Triptych" Lightroom Template from the Template Browser. Using the "Page Setup" button, I set an 8.5 x 11 page size in landscape format. Next, I used the Layout panel to define the Page Grid as having 1 row of 3 columns with a narrow space separating each cell as show in the screen capture to the right. Once your images display in the cell grid you can use your mouse to reposition them within the cell. To help separate them from the page I also added a 1 pt gray border around each cell using the "Stroke Border" option in the Image Settings panel. 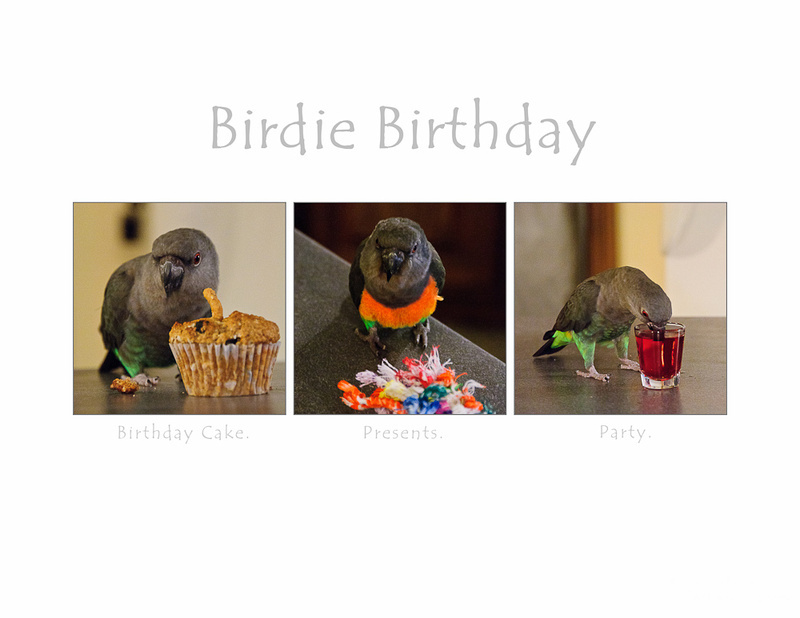 Now it's time to add the "Birdie Birthday" title. To do this, I simply created a new text Identity Plate (See Step # 5 in this post for more info) using the bold, 36 pt Tempus Sans ITC font. It seemed to fit the "birthday mood" :). Lastly, I wanted to add a brief caption under each cell in the triptych. If you've been following these Lightroom posts over the last several weeks, you'd understand why my first thought was to use the "Photo Info" option and apply my Copy Name preset as was outlined in this post. While it accomplished the goal, I discovered there's no way to customize the "Photo Info" font other than to adjust the size. That's when I discovered this next trick. I knew I needed to get this image into another editor like PhotoShop in order to add my captions. Unfortunately, there's no "export" from the Print module. Instead, you can use the "Print to:" option from the Print Job panel and specify to output to a JPEG File rather than to the printer. TA DA! With my triptych exported to a jpeg, I opened the file in PhotoShop and added text captions below each cell matching the title font and style. After saving the file, I jumped back to Lightroom and imported the final product back into the "Birdie Birthday" collection to admire the finished product. I was a little concerned that exporting to jpeg, editing the jpeg, and then resaving the file back as a jpeg again was going to cause some image degredation, but doing a side-by-side comparison of the finished product to the original images showed it held up pretty well. Remember, you could always save the finished product to a format that isn't being recompressed each time, such as a psd or tiff. That's all for this week. If you find the time to give it a try, add links to your finished products in the comment section below. Would love to see the results.